‘Taranga’ means ‘wave’ or ‘vibe’ in Sanskrit. It is not just a ‘solo’ release but – in accordance with his musical philosophy – unites again many eminent musical masters from India and Europe to create an energetic, yet intimate world music album full of depth, feelings and nuances. 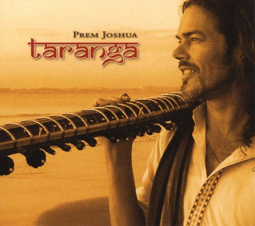 With this album Joshua focuses again more on the natural and acoustic sound scapes of the sitar, the bamboo flute and Indian vocals. At the same time ‘Taranga’ bridges the ancient musical traditions of India with the global and contemporary pulse of Urban Lounge and a touch of Jazz. The album also features again the warm and sultry voice of Sandhya Sanjana, known from his albums “Shiva Moon” and “Yatri”.